A thousand little things. 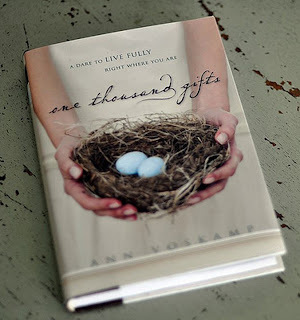 I've been counting my every day blessings most Mondays with Ann Voscamp of A Holy Experience. Ann is the author of One Thousand Gifts, a New York Times bestseller. 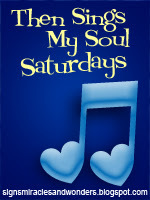 I'm linking up with Amy of Signs, Miracles, and Wonders for Then Sings My Soul Saturday. I play this song in my car on the way to work and I love it. Thank you for stopping by and have a blessed week! Hope you have a wonderful weekend. Relax and enjoy! The song made me think of my favorite psalm 139 :7" How precious to me are your thoughts, God! God's greatness towards me is beyond numbers, but "when I wake up, I'm still with him." Grace upon grace. What a perfect song to go along with counting our blessings; there are a thousand little things that bless our lives daily! Blessings to you sweet lady; hope your weekend is going well! Great song! "A thankful heart is a happy heart." ~Madame Blueberry (Veggie Tales) I know from Whom all blessings flow :)! I did read that blog post (you left the link to) on Friday. This is such a wonderful song. I am using it on Caleb's birthday DVD this year b/c we have been counting 1000 gifts as a family. Hope you are having a blessed week! Look Back, Forward or Always in the Present?